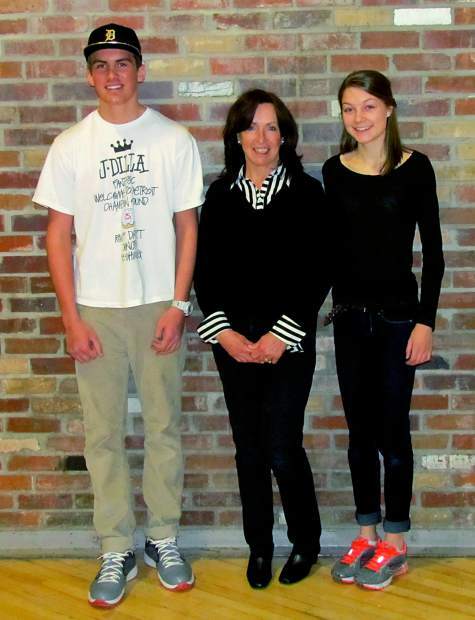 Aspen High School sophomore Tristan Niskanen (left) took third place in a civics-writing contest sponsored by the Pitkin County Republican Party, while the first-place winner was sophomore Elizabeth de Wetter. Second place went to Kelli Callahan, who is not pictured. In the middle is Pitkin County Republican Carol Jenkins. The Pitkin County Republicans recently held a civics-writing contest for Aspen High School. The following essay earned first place and was written by Elizabeth de Wetter, who received $250 for her piece. Though all of the amendments in the Bill of Rights play an important role in our society, I value the First Amendment most highly. Not only does the freedom of speech protect our right to say what we want, but it also allows us to read, write, broadcast, and sing what we want. While the other amendments also protect important rights, and will aid me at some point, they do not significantly affect my life. Since I have never been accused of a crime, sent to jail, or summoned to court, the Fourth and Eighth Amendments do not really apply to me at this point in my life. As I live with my parents, and our country is not currently involved in a war on U.S. soil, I do not feel the need to worry about housing troops, so the Third Amendment does not concern me. Finally, since I am under the age limit to own a gun, the Second Amendment is equally irrelevant. Even though all of the amendments are important, Because of the importance of the freedoms protected by the First Amendment, I believe it plays the most significant role in my life as an American. Freedom of speech provides one of the most crucial forms of self-expression and can replace violence. We can easily see the effects of oppression in countries where violence occurs on a daily basis, and it makes sense. People want change, and without freedom to say or write what they want, violence sometimes seems like the only option. By protecting freedom of speech, our government allows everyone in the United States the opportunity to express their opinions in peaceful ways rather than resorting to violence. Freedom of speech allows each of us to express opinions, persuade others, and ultimately change the world. As a female, I feel lucky to live in a county where I can show my face, go to school, get an education, and express my opinions on problems with which I disagree. I cannot imagine how frustrated I would feel if I could not change the reality of my life using words. When Malala Yousafzai spoke out, she was nearly killed by the Taliban, and this kind of oppression is the tragic reality of many women. Unlike oppressed women around the world, in the U.S., our words can create change without backlashing in the form of violence. Simple, every-day tasks such as answering questions in school or coming to a solution in politics would be very difficult without protection from the First Amendment. Problems usually have more than a single right answer, yet if we were not allowed to express our opinions, one answer might be the only result to conflict. Sometimes the most meaningful solutions come from disagreements between people, and when they can finally see eye-to-eye, better answers to the problem are found. Without the First Amendment, our country may not have passed the other amendments. Laws are made of words and when only certain words are allowed, only some voices can be heard, and a limited number of people can speak, the solutions that result are just as restricted. Unlike some rights to speech, the first amendment allows us to express ourselves during both good and bad times. In extreme wartime conditions, governments sometimes prohibit their citizens from showing any self-expression in the form music, dancing, singing, laughing, or even smiling, and yet we can do all of theses things and talk about them afterward without punishment. Though our opinions are not always positive and many times, when we express ourselves, we talk about something negative that needs to be changed, our words can change reality, and to me, the greatest freedom is to be myself and be able to make a change for others and myself through words instead of violence. While all of the amendments to the Bill of Rights play an important role in our county, the First Amendment provides me with one of the most meaningful freedoms as a female student and citizen of the United States. Freedom of speech allows me to create change in non-violent ways, and express myself without worrying about the consequences of self-expression. For the freedom to express my views, make a difference, and have the same rights as everyone else in this country, I am immensely grateful.